Some destinations just have an atmosphere that relaxes you, refreshes you and leaves you inspired; Seattle is one of those places. The city, located in Washington State, is creative and not afraid to take things at its own pace – which is ironic, considering it’s the fastest-growing major city in America. Dubbed the Emerald City for the wealth of green spaces that surround it, Seattle is set between Elliott Bay, Puget Sound and Lake Washington. The wilderness of Olympic National Park and Mount Rainier is within easy reach for energetic visitors in search of outdoor activities and escapes. Seattle has experienced significant growth in the last decade, but the city has always been groundbreaking. The city’s music scene has spawned legends such as Jimi Hendrix, Nirvana and Pearl Jam, and today it continues to support up-and-comers in the small bars that can be found across Seattle. Visitors can start their day with a coffee from the original Starbucks at Pike Place Market – a haven for foodies where organic produce comes farm-fresh. Culinary delights can be found at any one of the exceptional restaurants in the surrounding streets. For families, the Seattle Aquarium and Seattle Great Wheel are worthy detours. Visitors should also be sure to make their way to the top of the iconic Space Needle, the site of the 1962 World Fair, with its sweeping 360-degree views. Marking the centre of the city’s creative energy are the Museum of Pop Culture and Chihuly Garden and Glass, the latter of which celebrates the work of Dale Chihuly, the renowned Washington glass sculptor. For a glimpse into the past, the Klondike Gold Rush National Historical Park commemorates the 1893 boom that transformed the city from a logging centre into the North-West’s major port and, now, a leading tech centre. With this growth came Seattle’s first luxury hotel, the Benjamin Franklin, in 1929. With the landmark Orpheum Theatre next door, 1900 Fifth Avenue became the centre for social activity in Seattle. A year later, Frank Dupar and S W Thurston formed the Western International Hotels Company, headquartered on the same block. After the 1962 World Fair, the Orpheum Theatre made way for the Washington Plaza Hotel, designed by the same architects behind the Space Needle. It officially opened in 1969 and was combined with the historic Benjamin Franklin Hotel as the world’s first Westin hotel (a portmanteau of Western International Hotels). In 2019, the Westin Seattle celebrates its 50th year of offering stylish, innovative accommodation and collaborative meeting spaces, which include 29 meeting rooms and 69,000sq ft of event space. A recent redesign inspired by the region’s natural beauty reflects the tones of the Pacific North-West. The 1900 Fifth bar and lounge, a carefully curated wine and cocktail experience, pays homage to the site, which was once the heart of the city’s entertainment district. Health-conscious guests will appreciate the WestinWORKOUT centre, which is equipped with Peloton virtual trainer bikes. Meanwhile, RunWESTIN, a collaboration between the hotel group and New Balance, provides guided runs and route maps. 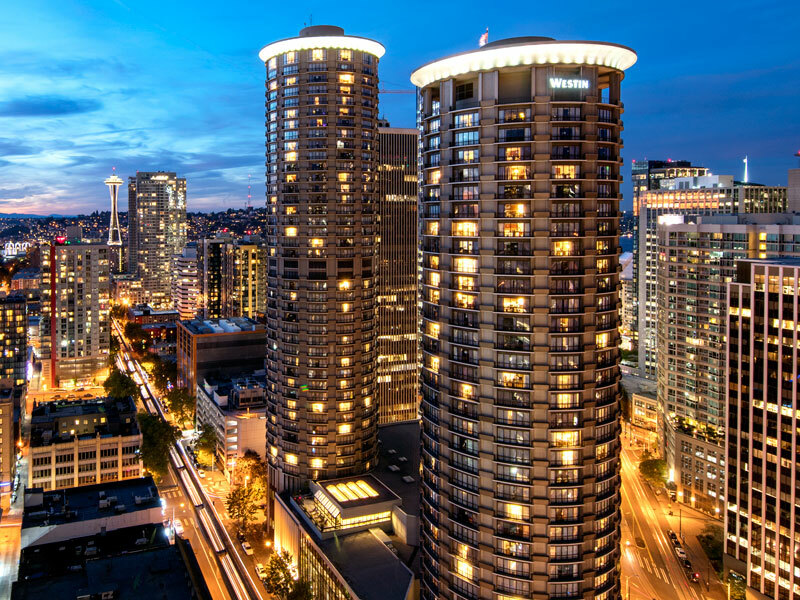 The Westin Seattle’s location places guests in the heart of Seattle, just a few blocks from Washington State Convention Centre and iconic attractions such as Pike Place Market and the Space Needle. Whatever draws you here, Seattle is a place that leaves visitors feeling enriched, energised and excited to return.